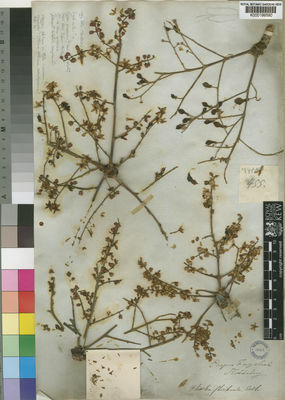 Boswellia papyrifera (Caill. ex Delile) Hochst. This species is accepted, and its native range is Benin to Eritrea and NE. Uganda. Trees up to 10 m. tall with a 2–3 m. clear bole, diameter at breast height up to 50 cm. ; bark smooth, pale, peeling in wide strips; slash reddish or streaky brown and white, exuding a fragrant resin; young branches pubescent. Leaves 20–40 cm. long, grey pubescent-tomentose; petiole 3–30 mm. long; leaflets 13–25, oblong-lanceolate, subfalcate, sessile; rounded, truncate or subcordate at the base, crenate or bicrenate at the margin, attenuate apically, with ± 11 pairs of principal lateral veins, up to 8 cm. long near the middle of the leaf, shorter above and below; a tiny caducous basal pair usually present just above the base. Flowers white or pinkish in pubescent semi-precocious compound racemes up to 30 cm. long; pedicels 3–6 mm. long in flower, up to 12 mm. in fruit. Calyx ± 2 mm. long. Petals elliptic, ± 5 mm. long, 2.5 mm. wide. Filaments glabrous, ± 3 mm. long, narrowing gradually from the base; anthers ± 2 mm. long. Ovary glabrous, sessile, ovoid, ± 1.5 mm. long; style ± 1.5 mm. long and 0.7 mm. in diameter; stigma globose, ± 1 mm. in diameter. Fruit glabrous, ± 22 mm. long, 7–8 mm. wide, widest ± 9 mm. below the apex; nutlets shield-shaped ± 5 mm. wide and 6 mm. vertically including a 1 mm. apical spine, the other 3 angles blunt. Stony hillsides in dry wooded grassland; 1200–1500 m.; rainfall 500–800 mm. A savannah tree (Boswellia dalzielii), similar to the last. Onana, J.M. (2017). Flore du Cameroun 43: 1-94. Ministère de l'enseignement supérieur et de la recherche scientifique (Mesres), Yaoundé. Gillett, J.B. (1991). Flora of Tropical East Africa, Burseraceae: 1-94. Vollesen in Fl. Eth. 3: 443, fig. 123. 1A–D (1990). Geerling, Guide de terrain des ligneux Sahéliens et Soudano-Guineens: 87 (1982). F. W. Andr., The Flowering Plants of the Anglo-Egyptian Sudan 2: 321, fig. 116 (1952). W.J. Eggeling, Indigenous Trees of the Uganda Protectorate, ed. 2: 51 (1952). Engl. in A. Engler & K. Prantl, Die Natürlichen Pflanzenfamilien, ed. 2,19A: 423, fig. 198 (1931). Engl. in A. & C. DC., Monogr. Phan. 4: 34, t. 1/23–32 (1883). Oliv. in Flora of Tropical Africa 1: 323 (1868). A. Rich., Tent. Fl. Abyss. 1: 148 (1847). Hochst. in Flora 26: 81 (1843).